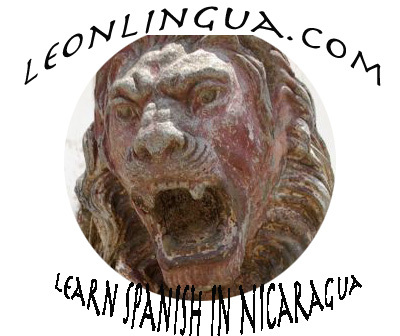 Leon Lingua is a language school that offers world-class Spanish classes in Las Peñitas, Nicaragua. Housed in Casa Elisa, we offer a variety of Spanish classes for students of all levels. Whether you’re preparing for exams, want to work towards fluency, or simply want to get on top of the necessities for your travel in Latin America, we’ve got customizable classes for everyone. We teach grammar in combination with communicative skills. If you are a Spanish student at a University in your home country we can help you arrange for a semester with UNAN studying Spanish here in Nicaragua. We colllaborate with volunteering project in Las Peñitas, Casa Verde, and we offer homestay to students who want the total immersion into the Spanish language. Leon Lingua is one of the few language schools in Nicaragua that exclusively utilizes teachers that have advanced and formal educations in teaching Spanish as a foreign language. All teachers at Leon Lingua receive a fair and competitive salary; all of the classrooms we use at Casa Elisa are well equipped with an exclusive internet connection, optional air conditioning, fans, and all necessary equipment like notebooks, and teaching materials is offerd at a fair price. We’re located in beautiful Las Peñitas, Nicaragua — a fishing village on the Pacific coast that is a short 15 minute drive from León, a colonial city that is the cultural and intellectual center of Nicaragua. Since Las Peñitas remains largely untouched by tourism, here you’ll discover an authentic Nicaraguan experience where Spanish is spoken almost exclusively, making it the ideal environment for both learning and practicing Spanish. When not in class, you can take surf lessons and catch world-class waves on one of several beaches or visit León and drop by local bars and coffee shops or take in concerts and museum exhibitions. Drop us a line if you want to learn more or sign up! We collaborate with UNAN León, one of two universities acredited from Instituto Cervantes in Madrid Spain. We are offering classes to help students taking courses with academic credits and proficiency exam SIELE. Try a demo exam here. Studying Spanish at casa Elisa is one of the best things I’ve ever done! I recommend this place to anyone who wants to learn this beautiful language. Far best teacher I have ever had.